The South Street Seaport's Pier 17 won't be around much longer in its current form as it awaits a $200 million overhaul by SHoP Architects, but this summer, the neighborhood surrounding it has some exciting plans in store that bring the hottest trends in temporary urbanism to the waterfront site. 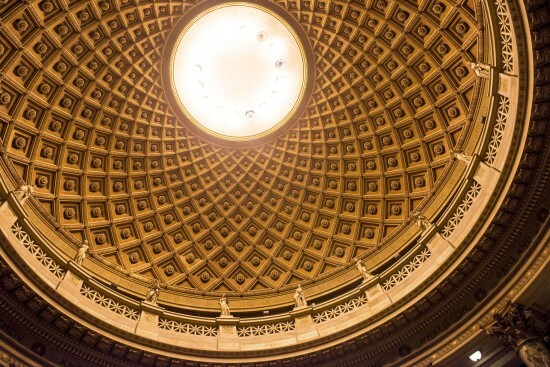 Starting on Memorial Day Weekend, the See/Change program will bring film screenings, a SmorgasBar, and pop-up shipping container boutiques in hopes of enticing New Yorkers back to this once-trendy Lower Manhattan neighborhood. The centerpiece will be a stage at Fulton and Water streets. A blanket of grass will cover the cobblestone street and wood-and-canvas beach chairs will be positioned to create an improvised theater for weekly concerts and film series called Front Row Cinema. South of the stage, restored shipping containers will be configured as an asymmetrical, two-story structure for small retail shops. 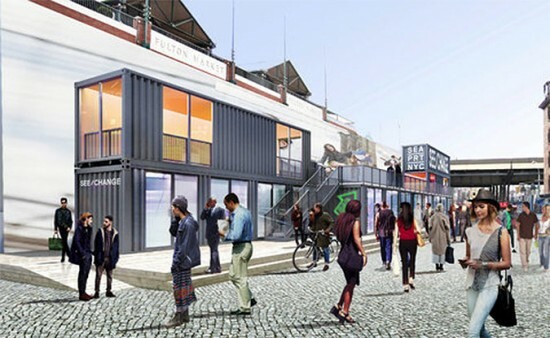 The second level will host SmorgasBar, a subsidiary of the well-known SmorgasBurg, which will turn east on Front Street to Beekman Street where Brooklyn-based food vendors will lure visitors with maple bacon sticks and oysters, among other treats. Plans are also in the works for Cannon’s Walk at 207A Front Street. The calm courtyard, which has been a place to relax and evade tourist hustle and bustle, has been handed over to Brightest Young Things, an experiential marketing agency. The New York Times reports Svetlana Legetic of the company says the space will be converted into a “surprise jewel box space where anything could happen.” Moreover, plans have changed for Pier 17. Previously scheduled to close for renovations, the mall will remain open to assist merchants who lost the holiday season to Hurricane Sandy damage. The seaport has long represented a hub of chain stores, but most ground floor shops remain shuttered to conceal overhauls still taking place. See/Change is an opportunity to bring new life and commerce to the neighborhood.